Anticipation danced about the glade. The still-hunt progressed tree to tree, bush to bush. Trail-worn buffalo hide moccasins depressed damp, winter-weathered oak leaves. Not too distant, a blue jay paid little mind. Autumn olive branches, bedecked with mouse-ear-sized greenery tugged at linen shirt sleeves or tussled with grayed hair strands. The morning ramble hesitated at two crossed deer trails. In due time, faint moccasin prints marked the westerly earthen byway: up the grade, around the spreading red oak, then along the ridge crest. At a slight dip, an inner voice urged a halt to the scout. I pulled the trade blanket around my bare thighs, scuffed away moldy cedar needles and sat with my back to a forked red cedar tree. The smell of fresh turned earth tickled my nose. The Northwest gun laid across my lap, unloaded, useless, a mere time-traveling prop. A gray squirrel frolicked to my left, and after a few minutes, two fox squirrels chased about down in the valley at the base of the ridge’s steep west-facing slope. The brass lead holder scribbled on a fresh journal page, recording the overcast clouds, the agitated crows hollering to the south, the geese honking on the River Raisin and the crimson-red cardinal that perched on a bobbing twig, halfway down the hill. Minutes passed, perhaps ten. My eyes glimpsed a bronze body with a bluish head weaving amongst the impenetrable tangle of autumn olive, barberry bushes and razor-sharp raspberry switches that grew from the valley’s floor. The wild turkey moved with an air of determined diligence. I lost sight of the bird where the trail begins to rise up into the cedar trees that border the hardwoods. But in a few moments, I heard a soft, crisp cluck, uttered about at the wagon ruts. Ten more minutes passed before I heard a second cluck. The hen’s location had not changed; she was waiting for a gobbler, I presumed. 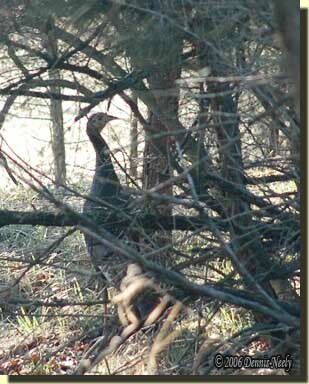 Quite some time later, after the squirrels had treed, I again glimpsed the wild turkey, returning along the same path. About where I had first seen her, the bird veered away, vanishing into the understory close to a doe trail that leads to the east side of a prominent knoll, a location frequented last year by a nesting hen. Immersed in the midst of an 18th-century adventure, it is sometimes difficult to heed an inner urge to “sit and stay.” Such inklings come and go at the oddest times in the heat of a simple pursuit. More often than not, if they slip by too fast and/or go unheeded a calamity awaits, sometimes significant, sometimes minor. I view such intuitions as a form of earned kinship with the tenants of the wild. On that particular pre-season turkey scout, I felt relaxed, excited, in tune with the forest and my alter ego’s inner being. When I minded those inner whisperings and took a seat against the forked cedar, I found myself rewarded with an outstanding performance by the woodland creatures. As a bonus, I gained greater insight into the habits of a nesting wild turkey hen and her tending gobbler. I stored that knowledge away for future exploitation. After the hen wandered back to the nest, I struck off to the west, following the ridge. When I emerged from the cedars at the wagon trail, that same inner voice suggested I check on the brush shelter, not too distant. I thought it strange at the time, because that shelter does not “fit” the new persona I have been developing. But, that morning’s circuitous route could meander that way, so I once again heeded the inner voice. I found the shelter in fine shape. On the way back to the truck, I kept wondering why I needed to check the shelter. Later that morning the telephone rang. At the time, I was engrossed in editing an upcoming traditional black powder hunting feature story for Woods-N-Water News that included mention of the shelter. A subcontractor for the power company wanted to do some preliminary work for a pole replacement project to the high-line that runs diagonally through the North-Forty. We agreed to meet in an hour, back in the woods. In 21st-century terms, the two-track that I refer to as “the wagon trail” in my 18th-century journal leads to the work area and passes within viewing distance of the brush shelter. When I drove by, I glanced at the shelter. In my mind, I thought something was amiss, but my overriding concern was meeting up with the line crew. On the return trip, I stopped at the fork in the road and walked back into the woods. The shelter was half flattened, and the closer I got, it became obvious a sizeable oak limb had dropped across the ridge pole. Earlier in the morning, not four hours before, the wind began to pick up as the historical me circled back and crossed time’s threshold. It blew hard enough to garner my attention about the time I was talking to Mike on the telephone. As I stood looking at the damage, I surmised the gusts were just too much for the limb, given the limb’s rotted heartwood. To say the least, I was a bit unnerved. When I built the brush shelter, I tried to follow the scanty instructions Meshach Browning left in his journal for what he called “a little shelter, made of pine bushes.” (Browning, 110) One of my first chores was to select a location. As a part of that process, I walked around the area and looked up at all of the trees, searching for “widow-makers,” or damaged branches that might come down with dire consequences. I thank God I was not sitting in that shelter at the time or worse yet, a traditional hunting guest, Tami or the grandchildren. 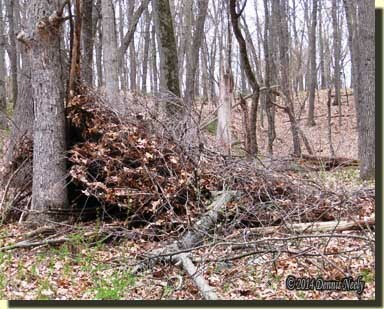 Over five-plus decades of woodland adventures (not all as a traditional black powder hunter) I have witnessed a number of trees or limbs fall unexpectedly. On more than one occasion, I have leaned against a tree and had it topple, and I have pushed some over, too. But this is the first time a forest abode has borne the brunt of the catastrophe. I had hoped the trading post hunter persona could continue to use the shelter, but that remains to be seen. Perhaps the message is it is time to move on and leave an unfortunate disaster behind? Give traditional black powder hunting a try, be safe and may God bless. This entry was posted in Hunting Camps, Turkey Hunts and tagged Dennis Neely, historical trekking, Mountain Man, Native captive, North West trade gun, Northwest trade gun, trade gun, traditional black powder, traditional black powder hunting, traditional blackpowder, traditional blackpowder hunting, Traditional camping, Traditional Woodsman. Bookmark the permalink.